"Ladies and gentlemen, wouldn't we be better off as dogs?" Kino on Video's ongoing relationship with the KimStim collection continues with this latest release, one of two Kawamoto releases, the other being his 2006 full-length film The Book of the Dead. Kawamoto is largely unknown in the West, but, given the general recognition level of animators these days beyond a small handful, that's no strike against him. Kawamoto began working in film more than 50 years ago, starting at Toho before striking out for Prague, where he learned under legendary puppeteer/filmmaker Jiri Trnka. Kawamoto has since produced a small number of beautifully designed and crafted films, always working under the ongoing constraints of budgets and hustling funds. 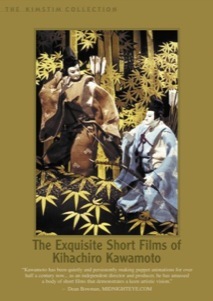 This disc collects several, but not all, of his short work; there is a English-subtitled Japanese disc available, should you be region-free capable and really interested, that includes more works than the disc at hand (11 to this disc's 7), and for not much more money, titled Kihachiro Kawamoto Film Works. The Breaking of Branches is Forbidden (1968): In this amusing piece, a young Buddhist monk with a taste for sake finds himself the victim of his own weakness after taunting a visiting samurai. The Demon (1972): Two brothers leave their mother behind to hunt. They survive an attack by a demon, tearing off her arm in the process. When they return home, they find a shocking surprise awaiting them. An Anthropo-Cynical Farce (1970): This French-produced short tells a short tale of conformity and its consequences, in the shape of a dog race. The Trip (1973): This surreal film lives up to its title quite well, presenting the inner journey of a young woman through various psychic events, all during the course of a city train trip. A Poet's Life (1974) Based on a Kobo Abe short story, this kiri-gami film (paper cutouts, essentially) revolves around a son and his mother, the latter finding herself turned into yarn at her own loom. Dojoji Temple (1976): Based on a Japanese folktale, this story of love spurned revolves around a young monk who finds himself the subject of unwanted advances from a young woman. When the woman transforms into a demon, her anger at being rejected comes to a bitter end for all. House of Flame (1979) Based on a Noh play, this final short is another love story that ends badly for all involved, as a young woman who cannot choose between two suitors dooms both them and herself through her actions. Going through the shorts included here, one can see certain themes emerge: the spiritual world versus the physical, the consequences of one's actions rebounding upon them, and conformity to name a few. It's a rather dark collection, all things considered. The overall beauty of the filmmaking cannot be denied in any event, and the puppets are beautifully-made and always a joy to look at. The paper-based shorts have their own qualities, but Kawamoto expressed dissatisfaction with them and returned to his puppeteering roots soon after. To be honest, I prefer the puppet work myself. Image Transfer Review: All the short films here are presented in their original full-frame ratio, and generally they look okay; some (b>The Trip in particular), however, display annoying flashes of combing between shots that becomes quite annoying. I assume that the level this shows up at will depend on the player you're using, so it may be a non-issue for some. Audio Transfer Review: The soundtracks to these films serve their purpose, but none would be showcase material, and none of them need to be. No major flaws are present. A solid collection of works by a master animator, The Exquisite Short Films of Kihachiro Kawamoto is let down mainly by some dodgy encoding and a total and utter lack of any extras. If you have an appreciation for animation and/or Japanese culture, then you really ought to give this a look.